“We are so grateful to welcome spring here at Rosewood! We have so much to look forward to this spring,” says Rosewood Executive Director, Connor Overbeek. With an array of seasonal events happening throughout the community, there is sure to be an activity you will enjoy. With a warm season averaging 84 degrees, it is important to limit exertion and protect your skin from the damaging effects of the sun. No matter your mobility limitations, spending time outside enjoying the sunshine and fresh air can be beneficial. Research has shown that Vitamin D from the sun can actually improve cognitive function. Before embarking on outdoor activities, consult with your doctor to discuss your limitations. With the Tennessee River and Chickamauga Lake located nearby, fishing is a popular spring activity. The area is home to a diverse fish habitat including Bluegill, Catfish, Largemouth Bass, Smallmouth Bass, Crappie and Blue Catfish. Grab your rod and reel and see what you can catch. Just look out the window and you are sure to see birds flying and chirping. Try and identify the birds or simply just relax and watch them play. Hang a birdhouse on a nearby branch for an up close viewing. The Battlefield Farmer’s, located in Rock Springs, is open each Wednesday and Saturday from May to November. There you will find fresh, locally grown produce, eggs, beef honey, baked goods, jellies, jams, crafts and more. The market also features live music, cooking demonstrations and other various activities. Few things are more synonymous with spring than baseball. Travel a few miles north to Chattanooga to watch the Lookouts play. The Chattanooga Lookouts are the Southern League Double- A affiliate of the Minnesota Twins. 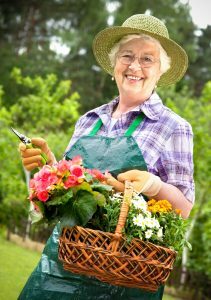 Gardening is a favorite activity for many through the spring and summer months. Whether you are planting a large vegetable garden or just a few flowers in containers, digging in the dirt can be a very rewarding activity. There are few things better than enjoying fresh, homegrown produce. In addition to seeing the beautiful flowers and colors of spring, walks are filled with health benefits. Regular walking can help to lower blood pressure, burn fat, build muscle and improve balance. Take advantage of the nice weather and sort through and organize closets and cabinets. Donate or discard unused items and make room for new treasures. You don’t have to venture far to enjoy the sights and sounds of spring. Travel to the nearby Chickamauga National Battlefield to see all the beautiful trees and flowers in bloom or head to downtown Chattanooga to see the sights and sounds of the city. Whatever activity you choose, be sure to take proper medical precautions. Decreased circulations and other medical issues can put seniors at an increased risk for heat related problems. When getting outside, it’s important for seniors to protect their health by dressing lightly, staying hydrated, drinking plenty of fluids, wearing a broad-brimmed hat with sunglasses, and applying sunscreen before heading out. We hope you get outside and enjoy spring in the south.